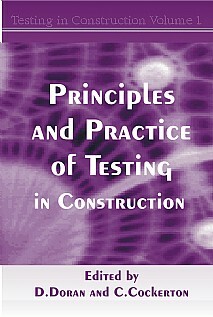 The first volume in the Testing in Construction series provides an introductory handbook to the essentials of the subject. In addition to a brief history of the subject, the authors deal with issues of fundamental importance, including laboratory planning, quality control and handling data. As a stand-alone volume it presents a concise application of this important aspect of construction - as part of the series, it forms the foundation of a valuable guide to good practice. History of testing; The philosophy of testing; The collection and presentation of data; Laboratory planning and testing equipment; Quality management; Standards and codes of practice; Future developments; Index. Consulting engineers and designers in civil and structural engineering; contractors and testing houses; civil, structural and materials engineers in academia, government and non- governmental research, information organisations and accreditation bodies; architects and chartered surveyors; postgraduate and advanced undergraduates in these disciplines.